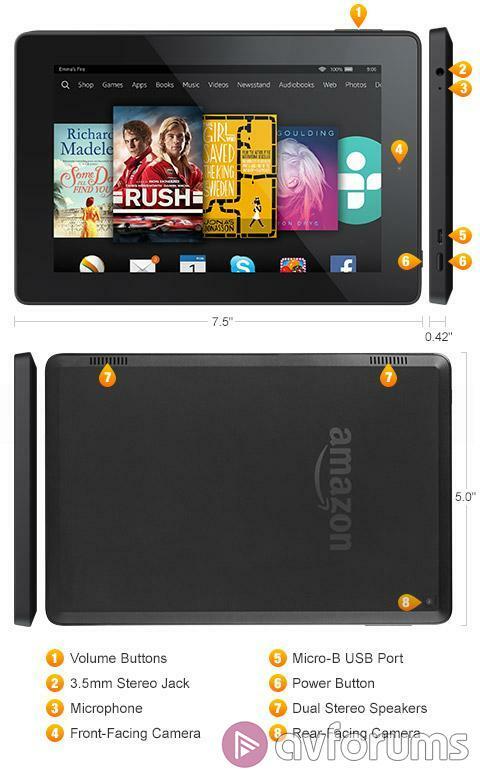 Kindle Fire HD 16GB 7"
The HD7 specifications aren't going to set the world on fire, but for the money, they are better than expected. The tablet features a Quad Core Media-Tek MT8135 1.5Ghz CPU, an Imagination Technologies PowerVR series 6 GPU and 1GB RAM. A decent upgrade from the previous generation HD7 which just featured a dual core CPU. The WiFi is just single band 2.4Ghz 802.11b, g and n and Bluetooth is also present; there is no GPS on the HD7. The 2014 refresh of the HD7 comes equipped with a front VGA camera and a rear 2.0MP (1080P) HD camera which was missing from the previous model. The quality is very disappointing though with the front camera not really good for anything other than perhaps video calling and the rear camera suffering from particularly poor quality in anything but the brightest of surroundings.